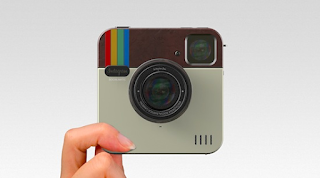 Suddenly, you know instinctively what Socialmatic is: the lovechild of a Polaroid camera and iPhone 4S, wrapped in a onesie made from Instagram's conspicuously retro corporate logo. Told that what you've seen is a digital fantasy, the product of a fertile imagination and hours of Photoshop, the post-modern aura is complete. It's like Bob Dylan editing a director's cut of Subterranean Homesick Blues in iMovie. Seriously, do you want this or some dopey e-paper wristwatch? 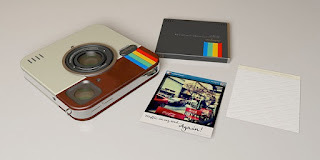 For now, Socialmatic is a dream, existing only in the mind of designer Antonio DeRosa. But DeRosa is actively seeking the "huge investment" needed to get his beautiful concept -- whose DNA includes interchangeable lenses, touch-screen display, WiFi, Bluetooth, and onboard color printer -- gestated from digital embryo to real world device. If this isn't an ideal Kickstarter project, MobilePhonesFan doesn't know what is.